Not so recently while traveling, I ended up in Tucson, Arizona. By design. The first dinner there, we had Mexican food. When asked what kind of food we would like for dinner the second night, my response was "Mexican." "Even though you just had some last night?" "What better place is there to get Mexican food? I didn't come all this way looking for Italian. Or Indian. Or Greek. Besides, we might as well get it while we can, since it doesn't get any better anywhere else." That might be a bit of an exaggeration, but it's not far off. And certainly the quantity of viable Mexican cuisine options drops like a rock outside of the southwest. Not many are viable, out east. Not many. So, we were off for more Mexican fare. And I wasn't the least bit sorry. Walking in, the first thing that hits you like a ton of bricks is that this is no ordinary Mexican restaurant. The decor screams ultra-modern-hipster-bistro. Easy to envision in any big city, except in the Southwest. Curved bar. White, upholstered seating, matched with dark chairs opposite. Ultra-modern pendant drum lights over the bar. I've been to Mexico, but I've never seen pendant drum lights there. Ever. And you won't find any sombreros here either. But that's okay. I wasn't there for the decor, classy, spartan, and pleasant as it was. I was there for Mexican food. 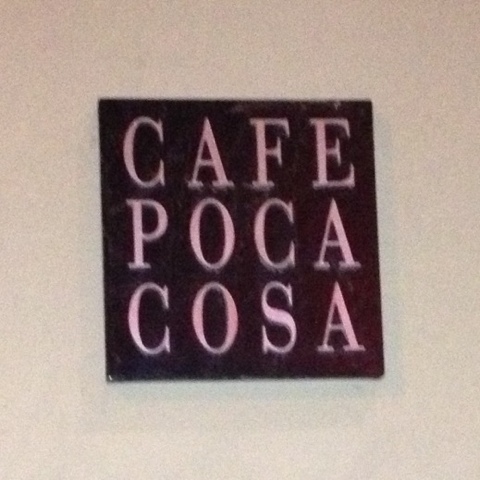 Also unlike any other Mexican restaurant I had ever been in, this one did not have printed menus. No miles-long list of every possible permutation of various meats reformulated between burritos, chimichangas, tacos, enchiladas, and tamales. Not here. Here, the menu changes daily. And is written in chalk on a portable chalkboard. I can't imagine ingredients getting old with this format! Our waiter introduced himself and explained the format. The chalkboard is the menu. He explained each item and then we ordered. That was it. They always have available a special of three, chef-selected items, but you have no input into which three. Selected by the chef. No options. No input. And whatever the chef selects for you will surely be different than what is selected for your table mate. And that is what I wanted. But more importantly, I needed gluten-free food. I needed to know which items on the chalkboard menu were gluten-free. But what I really, really wanted was the adventure of letting the chef select three gluten-free items for me. Could that even be possible? Our waiter would have to ask. And he did. Great news! They could and would put together three gluten-free items for me. Three! All gluten-free! And chosen by the chef. Outstanding! Just what I wanted. A bit of adventure, while being assured that I would eat safely. This beautiful plate is what was served to me. And every other plate brought to the table was just as beautiful, but different. Everything was extremely fresh. The peppers. The watermelon. The tomatoes. The chicken. The tamale. The beef. The salsa verde. Everything tasted wonderful and looked the part. 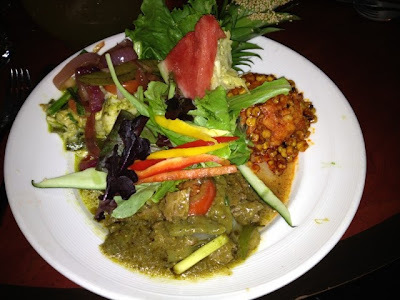 The flavors were full and fragrant and fabulous! The only thing to comment on besides the outstanding flavors and freshness was the tamale, over on the right, under the chopped corn salsa. It was very sweet, unlike any tamale I had ever had or ever expected to have. Sweet masa. Reformulated, it might have been a sweet corn muffin. But this was definitely a tamale. And it was definitely sweet. But not the filling, which was unidentifiable, but tasty. But not sweet. Quite a different combination. The food really was fantastic. 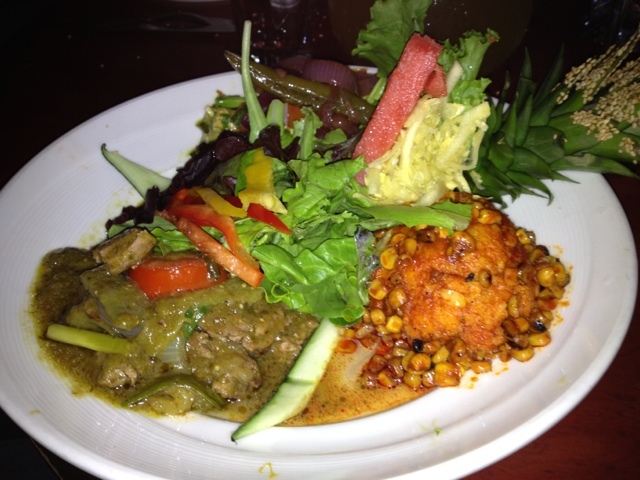 Fresh and flavorful and delicious! No Tex Mex here. You have to go east from Tucson to get that. 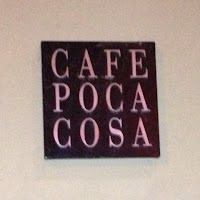 Cafe Poca Cosa is straight out of Sonora. And that, mis amigos, is straight out of Northern Mexico. This is Mexican food, from Mexico. And it is exceptional!